Why train with the snorkel? You may be seeing a lot of swimmers in the pool with a snorkel lately. The benefits are tremendous! Everyone should be training with one. 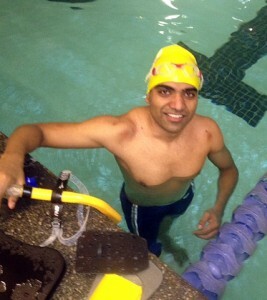 Swimmer is able to relax in the water not having to worry about “getting air” or gulping water. Helps swimmer aim for perfect technique while remaining horizontal (Allowing for great body balance, head position, rotation, hand entry, catch, etc.). Swim Slow and Move Fast! Do you ever see those swimmers in the pool who seem to go so far and fast but seem like they aren’t trying very hard? What’s up with that? How is it that they seem to be swimming slow but they are moving through the water like fish? It’s because they are. They are allowing their entire body—from the arms and shoulders through the torso to the hips and legs—to join the fun. Many people swim with just their shoulders and arms and hope they can drag the rest of their body along without sinking first. Rotation and glide is critical to a more efficient and effective stroke. In my experience teaching swimming, I find that the two biggest impediments to a well timed rotation and supported glide is awkwardness in the breathing and trying to balance with the recovery arm. Breathing should always be calm and controlled, even in sprints! Inhale through the mouth and exhale though the nose. Take time to exhale completely before taking another breath. The amount of time you are inhaling should always be shorter than the time you are exhaling. (Click here to find out why.) You should be rotating your head easily and looking slightly behind you on the inhale. Wait for your elbow to extend past your head before returning your head back into the water. Start exhaling immediately and smoothly through your nose. This process should become very rhythmic whether breathing every second, third or fourth stroke. The rotation should be full and done with your hips and torso, not the shoulders. Balance will come from your core. Your recovery (the hand that is traveling out of the water) should be just that, a recovery. It should be relaxed, free of tension, and placed into the water rather than thrown in. Practice leading you arm with the elbow and dragging your finger nails through the water during the recovery. If you can sustain that, you will be well on your way to becoming one of those swimmers who make it all look so effortless! It has a certain “Ring” to it! Gymnastic rings + you = super fun and strong times! Now, I know what you are thinking… It sounds a little crazy but trust me, you can do it and you will love it! 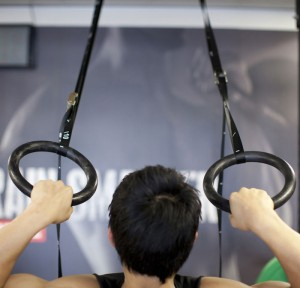 Gymnastic rings are a great tool to improve core strength, shoulder strength and flexibility, increase body awareness, and improve total upper body strength. I’m sure you can remember the last time you were upside down (those keg stands in college were a long time ago! ), but you should totally give it a shot! It’s amazing how just getting inverted will teach you so much about your body in space and show you just how little control and awareness you have! Pull ups: Sitting on the floor with your legs crossed and keeping that position thought the full movement, this can also be done assisted if you cannot do a pull up (yet!). Doing a pull up this way will increase core involvement, increase shoulder range of motion (rotating your hands at the top to touch your shoulders to the rings), and increase lat strength (starting from a dead stop and taking out any leg/hip flexor assistance), it’s amazing how pull-ups on the rings are so different than on a bar! Lock outs: Getting up on the rings and locking out your arms. Sounds easy enough…the higher the rings the more you have to jump into lockout; which is challenging to jump up and power your arms straight down at the same time. You can do lockouts for time, with hand rotations, or with knee/leg raises for added core effort. Getting into position over the rings takes a ton of tricep, lat, core, and shoulder strength! You will be amazed at how challenging this simple movement is! Ring Inversion: We start with the basics of just simply getting upside down. Getting your hips over your head is tough; ideally we work to do that starting under the rings with straight arms and pulling our legs up with just the use of our core and lats. That is incredibly challenging so using a bit of a pull up, getting a step in start, and using a spotter are all great ways to start. Once you get upside down you use your core and shoulders to maintain balance and control. When you come back to the floor we focus on core strength by slowly lowering your body down in a ball until your feet touch the floor. That is a tall order to say the least! These are just a few basic exercises we do with the rings. The possibilities are endless however. You will be amazed at how quickly your strength, control, and skill come along on the rings with just a little effort! Interested in trying out the rings? Come join the fun and challenging ring workouts today! Contact Personal Fitness Trainer Adriana Brown. SAC swimmers conquer 11 miles of open water swimming! 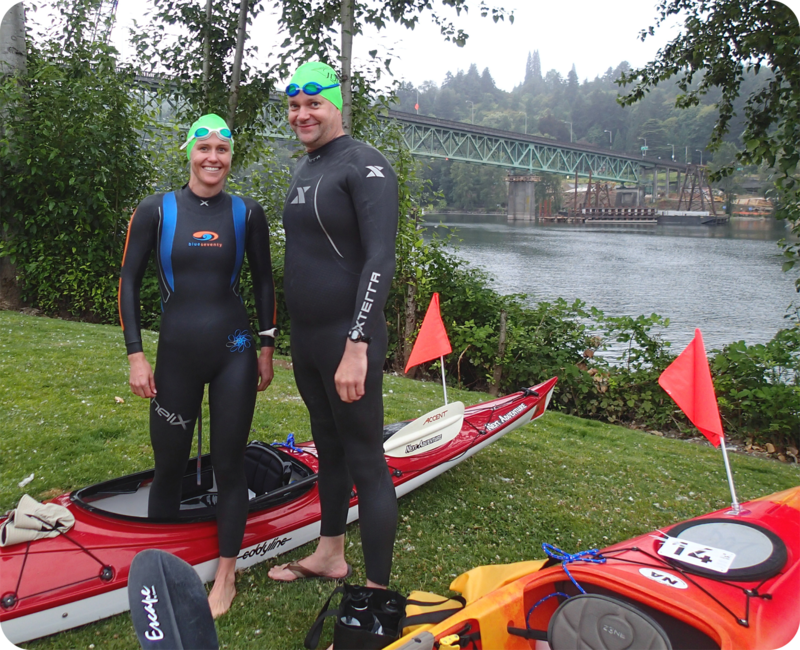 On June 22nd, 2012 at 7:00am, 36 swimmers jumped into Portland’s 70 degree Willamette River to conquer 11 miles of open water swimming. Two of those swimmers consisted of member Oscar Mraz and swim instructor Lindsey Highstrom-Millard. Oscar first came up with the idea to do the endurance event after being compelled by Seattle Athletic Club (SAC) swim staff the previous year to do some open water swims. After a 1 mile race and a 3.1 mile event Oscar decided to over triple the distance. He signed up early to ensure that there was “no turning back”, quickly urging Lindsey to do the same. Lindsey and Oscar spent the next the next 6-8 weeks getting serious about being in the water. They swam on average 6 days a week, and most of those consisted of double-days in the water (with a min of 2-3 days in the open water). They met often at 5:15am to get in mileage before heading off to their full-time jobs and spent many hours in the swim conditioning classes at SAC. Biggest mileage training weeks were in the range of 22-24 miles of pure swimming bliss with the longest training session being 6.5 miles. Going into the race both Oscar and Lindsey had separate game plans. Lindsey coming from a collegiate swimming background at Arizona State decided a positive attitude and “pain” would be the guide to swimming her furthest distance to date. While Oscar decided to start out very conservatively, build from there, and use his kayakers as his guide to limit sighting to conserve energy. Each fueled throughout the event with nearly 1500 calories of gels and electrolyte drinks, provided to them by their kayakers on poles, as the swimmers were not allowed to hold onto anything during the swim. The biggest highlight, outside of this amazing feat, was the two emerged from the water at exactly the same time of 4 hours and 20 minutes, both winning their respective wetsuit categories for men and women. The two emerged together at mile 7.5 and swam the remaining 3.5 miles together. This just goes to show that the athletes that train together, place together! And after all this, they can’t wait to do it again! Your body weight is 1/10 of what it would be on land. Be aware that heart rate decreased 10 beats per minute e in water and max heart rate decreased by 10-30 beats….it is believed this is due to the lower water temperature and the lesser pull of gravity in water. The entire family can do it! Due to its low impact it can be done through all stages of life. USMS- masters swimming…has age groups of 100-104! the fact that you can call yourself a swimmer is a reward in itself! Well, not exactly but emulating a chicken’s neck (or a giraffe’s, or a turtle’s, or even *Tim Duncan’s) will help you swim farther and faster with less effort. Effective swimming requires an effective glide. The way to an effective glide is by creating a hydro-dynamic tube around your entire body that you can slip through with minimal effort. Of course getting to that effortless place requires a lot of effort … but you can do it. Really! Look at a chicken (or a giraffe, or a turtle, or even Tim Duncan) and you’ll see that they all have really long necks. Moreover, they all have really flexible necks that can lengthen and shorten at will. They extend and contract through their cervical vertebrae which enable them to rotate in a greater radius with less effort and distortion to the rest of their bodies. Look at your typical adult and you’ll see that their necks aren’t very flexible at all. This poses a special problem for swimming: in order to breathe effectively while swimming you need to be able to rotate your head independently from the rest of your body, and the only way to do that is by unlocking your neck, which means extending through the back of the your neck. Here are some exercises to help you unlock your neck and extend it to an effective gliding posture. Try them before you start your next swim. Align your eyes to be horizontally level and your nose to be vertical like a T-Square. Hold that position, engage your core, and rotate your body as far as possible without losing your head position. Practice lengthening the back of your neck so that your chin naturally lowers a bit verses tucking your chin. Do the same things in the water while practicing your initial push and glide off the wall and notice if you go in a straight line just below the surface of the water. If you’re going deep toward the bottom, you are probably tucking your chin. If you’re breaking the surface of the water too soon (i.e., before you intend to) then you are probably raising the back of your head. If you’re not gliding very far at all you may be ‘riding the brake’ by looking forward. If you’re holding a level line just below the surface of the water, your neck is probably in pretty good position. So pick your goofy role model and have fun as you practice gliding! * Before Tim Duncan became a Hall of Fame NBA Basketball player with a fist full of championship rings he was on track to becoming an Olympic swimmer. If you have any questions about this post or training with Nathan, please feel free to send him an email.